This year’s Ghent Film Festival celebrated its 40th anniversary. With a focus on American independent movies, and in particular the movies of Martin Scorsese, a lot of screenings of the director’s most famous movies were shown. Also a large exhibition has been inaugurated at the Caermersklooster. However, the festival shines with its endless support for film music. Since 1985 it has been inviting composers and organizing film music concerts. Maurice Jarre, Georges Delerue, Elmer Bernstein, Gabriel Yared, Patrick Doyle, Howard Shore and Hans Zimmer are all friends of the festival and have been present on several occasions. In 2001 the organization created the World Soundtrack Awards in which the composers and industry have been able to bring forward new talents or award their favourites. On the programme this year; no less than five concerts, a seminary, composer documentaries and a CD release. IFMCA members Tim Burden, Bregt De Lange, Thomas Glorieux and Eleni Mitsiaki were all present in the lovely city of Ghent, Belgium, to take part in the events of this anniversary’s edition. On Tuesday 15 October, composer and producer John Parish attended and performed his music for Screenplay, a collection of some of his film scores. It was brought live to scenes from some of the films, including Sister and Little Black Spiders. One day later, Dirk Brossé and the Brussels Philharmonic performed a unique concert at the Handelsbeurs venue. 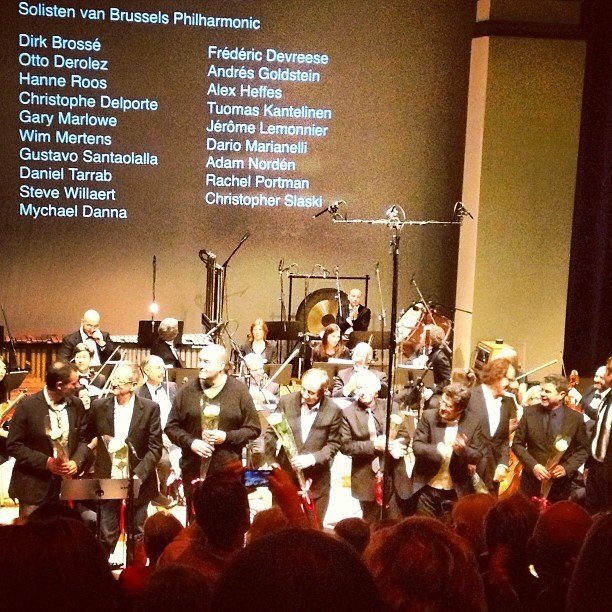 40 Years Film Fest Ghent: A Music Celebration highlighted the importance of film music in Ghent. Conductor Dirk Brossé invited 40 composers that have been to or have been awarded in Ghent, to write exactly one minute of music for 28 musicians to be included in an anniversary event. Some of those who participated are Elliot Goldenthal, James Newton Howard, Shigeru Umebayashi, Howard Shore, but other friends of the festival Fernando Velázquez, Adam Nordén, Tuomas Kantelinen, Andrés Goldstein and Jérôme Lemonnier deserve to be mentioned as well. Some of the composers present during this night were Dario Marianelli, Rachel Portman, Gustavo Santaollalla and Frédéric Devreese. An extra bonus to the night was the live performances of Wim Mertens on piano, Gustavo Santaolalla with a guitalele (a guitar and ukulele combination), Gary Marlowe with electric guitar and Daniel Tarrab with double bass performing a sensual tango. Flemish composer Steve Willaert introduced the audience to the sound of a new American musical instrument called arpeggio. As part of the focus on Martin Scorsese, the Brussels Philharmonic and Dirk Brossé brought a some of the best music from the films of the director. Scoring for Scorsese was the definite highlight in this year’s festival because of the very strong performance and varied selection of music. It’s a grateful job to select pieces from the musical oeuvre of Scorsese’s movies. One cannot forget the opening of Bernard Hermann’s Taxi Driver and the beautiful theme on saxophone that follows, or Philip Glass’s intriguing music for Kundun. A lot of the music performed was composed by Howard Shore, recent collaborator for a lot of Scorsese’s movies. The obvious highlight was the music from The Aviator, which the orchestra also performed for the score itself. Next to original film scoring, a few modern classical pieces had been selected, from composer Max Richter’s On the Nature of Daylight to the creepy Passacaglia of Penderecki, both used in Shutter Island. Coinciding with the concert, also a CD has been released with a recording of the same selections. 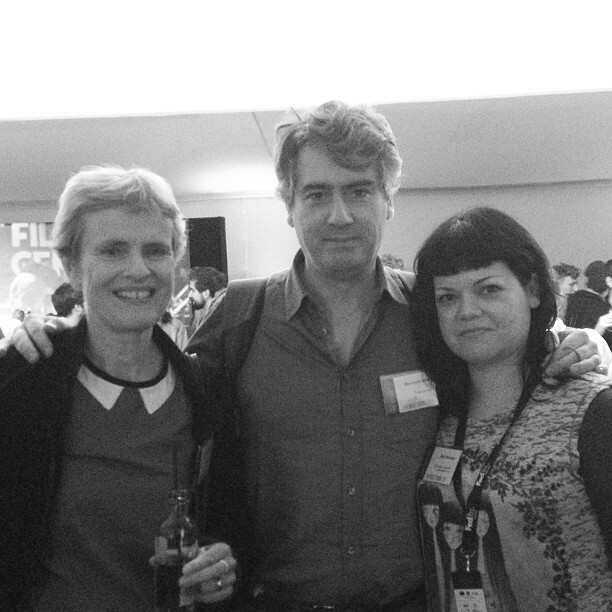 On Friday, Rachel Portman, Dirk Brossé and Dario Marianelli were the guests at the annual film music seminary. Sold out to a very varied public, the composers talked about their collaborations with several directors. 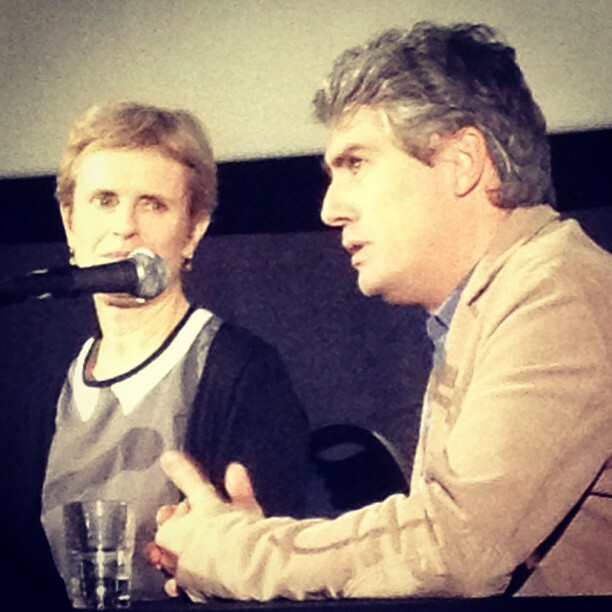 Rachel Portman of course talked about Chocolat composer Brossé had a talk about his upcoming work for Singularity and Dario Marianelli revealed the secrets behind his Anna Karenina score. Later that day, one of Scorsese’s favourite silent movies, 7th Heaven by Frank Borzage, got to see a new score by Dutch composer and journalist Kevin Toma. His music was performed live to the images at the Conservatory in Ghent. 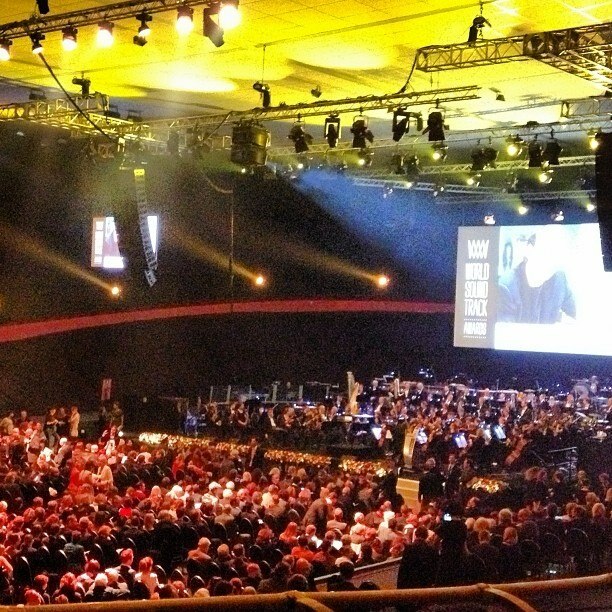 The last day of the film festival traditionally ends with the World Soundtrack Awards, the finale of a week of concerts. Mychael Danna took away the two most prestigious awards, Best Original Score and Best Composer, both for Life of Pi. His hilarious video messages (he couldn’t attend the festival) certainly vamped up the somewhat stale award ceremony. The duo Benh Zeitlin and Dan Romer won the Discovery of the Year award for their joyous music for popular Beasts of the Southern Wild. Unexpected and somewhat out of nowhere, the Turkish composer Rahman Altin won the Public Choice Award for The Butterfly’s Dream. Guest of Honour this year was composer Alexandre Desplat, who had received the Best Composer award four times in the past five years by his peers at the WSA Academy. The Lifetime Achievement Award was presented to Italian composer Riz Ortolani. Some of his most well-known music was performed during the first half of the concert. Highlight was the fantastic performance of Addio Zio Tom (Oh Ly Love), a song that was used recently in the movie Drive. Other selections included Mondo Cane and I Giorno Dell’Ira. Desplat’s music for Hollywood movies dominated the second half of the event. Starting off with the fine music from Rise of the Guardians and the main theme from Twilight: New Moon, quickly followed by a unique performance of the theme for Roman Polanski’s Carnage and The King’s Speech. The Harry Potter Suite was perhaps a little too long because it went through all the climactic pieces from both of his scores for the series. A definite highlight was when the composer himself took the baton and conducted the piece The Candidate from The Ides of March. With his frequent collaborator Vincent Ségal on the electric cello and Jeff Boudraux on the solo drums, Desplat himself was swinging to the melody. A great suite from The Ghost Writer, ending with the sublime The Truth About Ruth, was the finale of a fine, although fast paced, concert. However, on a sidenote, it’s a pity none of his recent French scores got some playtime. Both Alexandre Desplat and Riz Ortolani also joined a Q&A with fans and press at the Meet & Greet on Saturday afternoon. Desplat’s dry humour kept it fresh and entertaining even though the composer had a very hectic interview schedule in the morning. In their presence a lot of other composers, including Thomas Newman, who was invited by the organization for a concert one of the next years, and attracted a lot of attention from the attendees. Newman himself was visibly amazed by all this. He was very receptive to suggestions from Dirk Brossé and Tim about possible concert selections; Meet Joe Black’s That Next Place, Little Woman’s Opening Titles and Scent of a Woman’s Court Room Finale. An anniversary year to be proud of. With so many film music events, Ghent surely is one of the most interesting festivals for film music fans around. 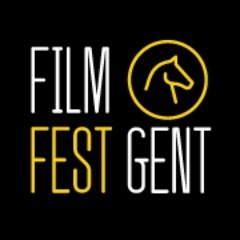 The next years of the Ghent Film Fest promise to be interesting. Next to all that, visitors can discover Ghent, one of Belgium’s best kept secrets.